Australia – June 11, 2014| Finally, the long-awaited report about the violence that took place between February 16 to 18, 2014 in Papua New Guinea’s (PNG) Manus Island detention centre is released three months after the incident which left an Iranian asylum seeker, Reza Berati, dead and over sixty others injured. The 107-page report was prepared by the former secretary of Australian Attorney General Department, Robert Cornall, with the assistance of five officers of Australian immigration department. The report has identified a PNG national employed by Salvation Army as allegedly being the man leading the fatal attack on Mr Berati. Some other people including the G4S security company guards have also been alleged in the report to be involved in the attack. The report has termed the “anger and frustration” of the asylum seekers developed as a result of an uncertain future, non-settlement in Australia and unknown period of time in detention as the cause leading to the violent protest at detention centre. It says the G4S guards entered the detention centre and attacked the asylum seekers causing physical injuries and property damage. Eight asylum seekers were arrested and charged by PNG police following the violent protest, it states while being silent if any person from centre management or security company was also charged or not. Quoting the detainees, the report further says PNG nationals, expatriates and police entered the detention centre and dragged the asylum seekers outside to be beaten. The report has also revealed the development of a racial tension between the Iranian asylum seekers and PNG nationals working in the detention centre which immigration minister, Scot Morrison, has attributed to Iranian asylum seekers’ disrespectful and racist remarks against PNG nationals employed in the centre. While some quarters have appreciated this official report, many others have rejected it as being unreliable. 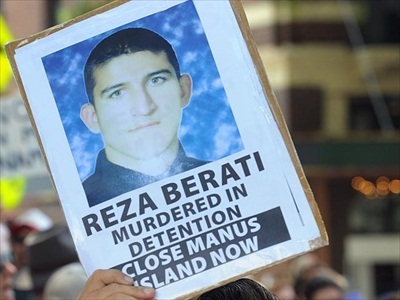 Amnesty International has remarked the report has failed to acknowledge both the Australian and PNG governments share the responsibility for the death of Reza Berati and injury to many others. “The fact the inquiry was conducted by former secretary of the Attorney General’s department makes it far from independent. What needs to happen to ensure justice is a full judicial inquiry from which true accountability at both the government and individual level should flow, including criminal charges against those responsible for the violence and killing of Reza Berati, without recourse for the death penalty,” says Graeme McGregor, the spokesperson for Amnesty International. Refugee Council of Australia (RCOA) has described the report as inadequate leaving behind many critical questions unanswered. RCOA chief executive Paul Power has said the identity of chief suspect in Reza Berati’s murder has been widely known for months and was confirmed in the Cornall report. It was astounding that no charges had been laid three months after the murder, he said emphasizing the PNG authorities must either act now or give an explanation of the delay, indicating when charges are likely to be laid. “It is obvious that what happened on Manus Island was the end result of a system designed to be so cruel that it would act as deterrent to asylum seekers arriving by boat to plead for refugee protection in Australia,” Mr Power asserts. Security company, G4S, has also expressed its reservations on the report claiming “the discipline and at times courageous actions of G4S staff prevented further serious injuries being sustained.” In a submission to the upcoming senate inquiry into violence on Manus Island, the company has blamed slow processing times, poor fencing, inadequate staffing levels and the aggression of the PNG police and asylum seekers for the unrest at the detention centre. Salvation Army, in its submission to the senate inquiry, has also rejected the report by calling its employee accused of murdering Reza Berati a hero. The submission says the employee was attempting to help the asylum seekers caught in the attack rather than inciting the violence. PNG police have also slammed the report by describing it contradictory to eye-witnesses accounts of event and a major cover up. Deputy Police Commissioner Simon Kauba termed it as inconclusive and unworthy of being relied on to prosecute the case of Reza Berati’s murder. He also complained about the lack of cooperation by Australian agencies, G4S security company and asylum seekers to complete his inquiry. He accused the Australian government of secretly flying the injured asylum seekers to Port Moresby for medical treatment after the incident barring them from interviewing the injured. As the hue and cry on Robert Cornall report and PNG police’s inability to charge anybody for Reza Berati’s murder is yet to subside, detained asylum seekers on Christmas Island also resorted to protest to mark the 100 days of Mr Berati’s murder and prolonged delay in processing of their asylum claims in the last week of May. Some asylum seekers were stated to be on hunger strike while some others were reported to have sewn their lips. The protest ended up in clash with security staff resulting in injuries to as many as six asylum seekers as according to immigration minister. The protest was brought to an end after the government sent in reinforcement, the minister claimed. However, the situation in detention centre is still tense and could flare up anytime if the government’s harsh treatment of asylum seekers continued as is being pledged by the immigration minister. Allowing for the tense situation at detention centres, both onshore and offshore, and the growing frustration among the detainees, it is high time Australian government abandon its hard-lined immigration policy and commence the processing of their claims for protection. Most of these asylum seekers are in detention for more than a year and any further delay in this regard could lead to another Manus Island-like tragic incident and this time the number of casualties would probably be much higher given the deteriorating mental conditions of the detainees. Those released into community are also needed to be processed quickly as, being uncertain about their future and away from their families for years, their mental and physical conditions are also getting worse with each passing. Moreover, those involved in Manus Island violence and Reza Berati’s murder must also be brought to dock without any further delay to appease the anger of asylum seekers and console the victim’s family who are impatiently waiting for justice.